The modern Escalade is giant and comfortable and now slightly more efficient than it used to be. It's also wildly popular. Cadillac has added shifts to their Arlington, Texas factory to try to keep up with demand but they can barely keep them in stock. Escalade sales were up 149% year-over-year in January, making it now more popular among the upper classes than casual racism. That's good if you want to make money, but bad if you want to build a car brand. The failure of the ATS and CTS to hit their targets is costing GM. To kindle demand, Cadillac has offered subsidized leases, discounted financing and rebates. Consumers are being given $1,000 on the 2015 ATS and 2015 CTS, $4,000 on the 2014 ATS and $6,000 on the 2014 CTS. But some dealers are getting additional subsidies from Cadillac — up to $5,000 more on the 2014 ATS and up to $7,000 more on the 2014 CTS — to help clear out unsold cars. So you can't make another truck brand (ahem Hummer) so what are you going to do? 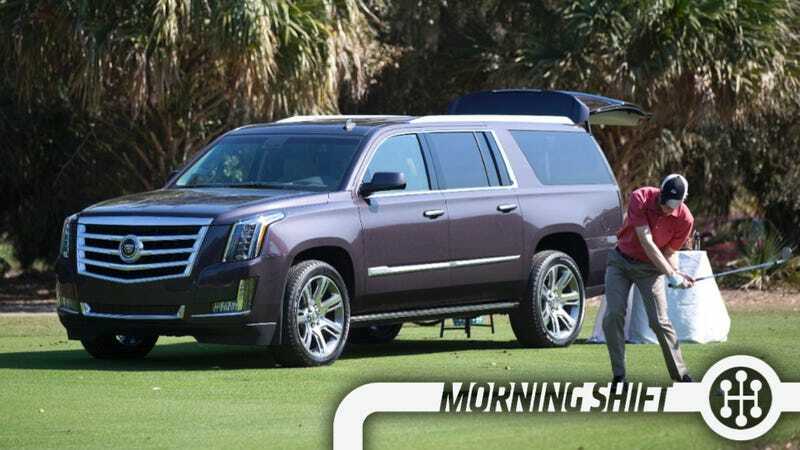 Should Cadillac be all about SUVs? It all comes back to the flagship issue. If your flagship is a truck – and the Escalade is Cadillac's flagship – you're going to be a truck brand. Lincoln has the same issue. Cadillac's cars are great, but you need a premium car at the top to be a premium brand. BMW struggled chiefly in China, where its dealers halted orders over a dispute about sales targets and bonuses. Including Mini models, the carmaker’s sales in the world’s largest market rose 7.9 percent, compared with gains of about 15 percent by Audi and Mercedes. It doesn't help that that both the 7-Series and X3 are getting a little old. Skoda remains our favorite Volkswagen badge, offering fun variants of popular platforms at a reasonable price. Renault's Dacia, too, is sort of an interesting brand to us Americans who don't have to regularly drive them. It turns out that Europeans love both brands, too, mostly out of a desire to not spend all their money on cars as their economy slowly comes back. Last year Dacia rose 24% while Skoda rose 14%. Buyers trading down are turning to Dacia and Skoda, two brands that once were considered stodgy ex-Communist brands that made unsightly and unreliable cars. Quality steadily improved as the parent companies invested heavily over the past decade. Both now have a cost advantage from manufacturing in Eastern Europe—the Czech Republic for Skoda and Romania for Dacia—where labor costs are far lower than in Western Europe. The difference between budget brands’ starting list prices and those of similar models by the market leading brands is stark: The Dacia Sandero, a small four-door hatchback that is one of Dacia’s most popular sellers, is listed at €7,990 in France. The vehicle comes without air conditioning, power locks or a radio. In contrast, similar-size but better-equipped Skoda Fabia is priced at €12,640. Meanwhile, a four-door Volkswagen Golf starts at €17,388. Every time I've been to Europe I've seen something like a trillion Dacia Dusters and, frankly, they don't look that cheap to me. There's been a ton of hand wringing over the increase in subprime auto loans, even though I've felt that in an economic recovery you're going to have to give loans to some people who aren't necessarily credit-worthy. About $30 billion to $40 billion of subprime car loans are held within asset-backed securities, compared with the $203 billion of such loans outstanding, Pink said today during a panel discussion at a conference in Las Vegas. While subprime volumes are growing, borrowing by the weakest-credit borrowers represents only about 20 percent of auto-loan originations, compared with a peak of about 30 percent before the 2008 financial crisis, he said. “I don’t think you’d come away” from looking at those figures “saying it feels like the ABS market is driving a resurgence of subprime,” Pink said. Maybe not, but people who had roughly his job at different banks said the same thing about all sorts of securitization that happened before the economy imploded in 2008. 5th Gear: Do You Have Minivan Fever? The F-150 is Ford. The Chrysler Minivan is Chrysler. Company officials said today that 80% of the equipment at the plant's body shop and assembly line will be new when the plant resumes production in May. Over the next 14 weeks more than 1,500 contractors will be crawling all over the sprawling, 4.4-million-square-foot plant, which has been making cars and trucks since 1928. A total of 822 new robots will be installed in the body shop alone. In the assembly area, a new "skillet" line that can raise or lower the shell of the car to match the height of workers will replace an overhead conveyor. The question, of course, is what will it look like? If someone has any information please send us an email to tips@jalopnik.com. On this day in 1966, Ralph Nader, a young lawyer and the author of the groundbreaking book "Unsafe at Any Speed: The Designed-In Dangers of the American Automobile," testifies before Congress for the first time about unsafe practices in the auto industry. Neutral: What Are Your Cadillac Thoughts? Should they keep prices up? Should they change their model? Should they build more trucks?